Right before his third birthday, Ben’s parents noticed something his walking was wobbly and he would often lose his balance. Concerned, they went to the doctor and Ben was immediately admitted into the hospital. After an MRI it was discovered that Ben had a brain tumour. Worried, his family spent the days leading up to his surgery at his bedside not sure if the tumour was cancerous or benign and what his future held. Most of the tumour was removed during surgery, which thankfully, was not cancer. Now began Ben’s recovery and returning to normal life. Recovery for Ben has meant learning how to walk again and ongoing monitoring of the tumour. Ben has been coming to Kids Kicking Cancer’s weekly Heroes Circle classes as part of his recovery. 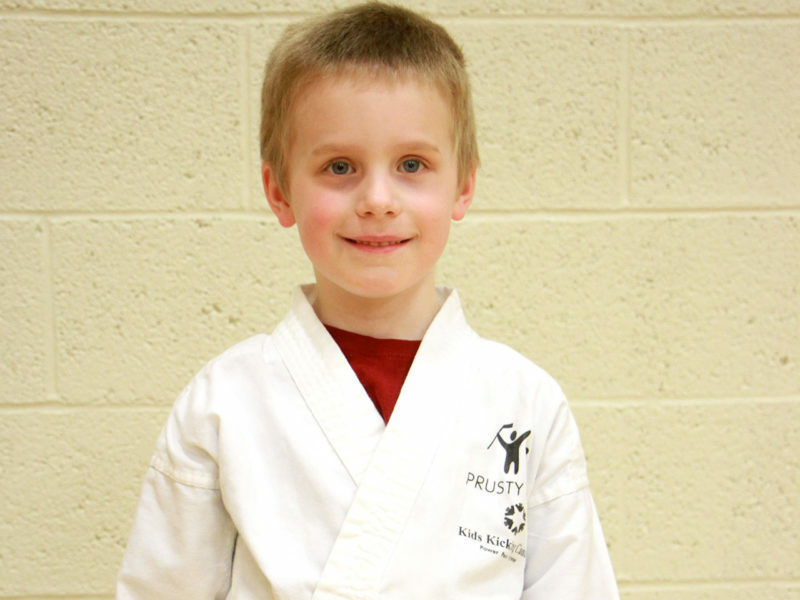 With the guidance of the specially trained black belt martial arts therapists, he has learned relaxation techniques and breathing exercises to help control his frustrations. He has also found himself amongst new friends who are experiencing the same challenges.